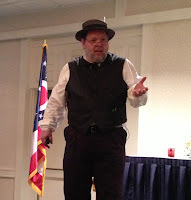 The first day of the Ohio Genealogical Society 2013 conference got off to a nice, relaxed 11:00 am start—which was good, because from then on, it was one busy day. I attended three class sessions and a banquet, and made a couple of quick laps around the exhibit hall. The Millennium Hotel is in downtown Cincinnati, right across the street from the Duke Energy Convention Center, site of the 2012 National Genealogical Society conference. This gave me a little déjà vu feeling every once in a while. The Hamilton County Genealogical Society certainly worked hard as host for these two big conferences back-to-back. While I won’t actually summarize the lectures I attended, out of respect for the presenters’ material, I’ll try to offer a couple of take-away points from them. This is partly to help people who might be interested in ordering the recordings from JAMB, who taped the presentations. The recordings should be available soon. You can see the full schedule of presentations here. Tom Jones opened the conference with the keynote address, “Strategies for Finding ‘Unfindable’ Ancestors.” This was the kind of lecture you can listen to over and over again and pick up something new each time. I think it’d be especially helpful to listen to it again after studying the articles in the National Genealogical Society Quarterly (NGSQ) that he referenced. Tom noted that recognizing why your ancestor seems “unfindable” may help you figure out how to find him or her. He identified 38 research barriers in eight categories, illustrating his points with samples of four case studies drawn from the NGSQ. Although he warned us that there is no quick and easy way to solve these difficult cases, he offered a number of strategies that may lead to success. This is an information-rich lecture that gives intermediate and advanced researchers a lot to think about. “Proving Immigrant Identities: Once in Europe, Then What?” (session T07) by Warren Bittner—After encouraging us to think deeply about our documents, Warren offered a variety of tips for U.S. and European research on immigrant families. He advised doing thorough U.S. research before trying to jump the pond, using gazetteers and maps, and tracing friends and associates. My take: Dates and locations, rather than a name, might be the keys to an immigrant’s identity. Given the complexities of German records, I have more work to do here before I try to find my Herrel family there. “Self Publishing for the Genealogist: Tips, Tricks, and Tools” (T11) by Lisa Alzo—Lisa presented an informative lecture on the rapidly growing and changing world of self publishing, particularly digital publishing (ebooks). She outlined some questions you should ask yourself, steps to follow in the family history writing process, challenges you might face, and various platforms and distribution types. My take: With all the choices available today, it’s tremendously helpful to get practical advice from someone who has experience with these publishing platforms. Lisa shared her knowledge generously. “Documents and Books on the Web” (T22) by Barbara Vines Little—Barbara walked the audience through a variety of websites that are publishing original documents and materials. I knew about the Library of Congress/American Memory site before, but didn’t realize how much it offered. I also discovered many university sites that are making their unique collections available. My take: These sites will make it easier to find social, topical, and historical background for my family history, and should keep me busy exploring for a long time. 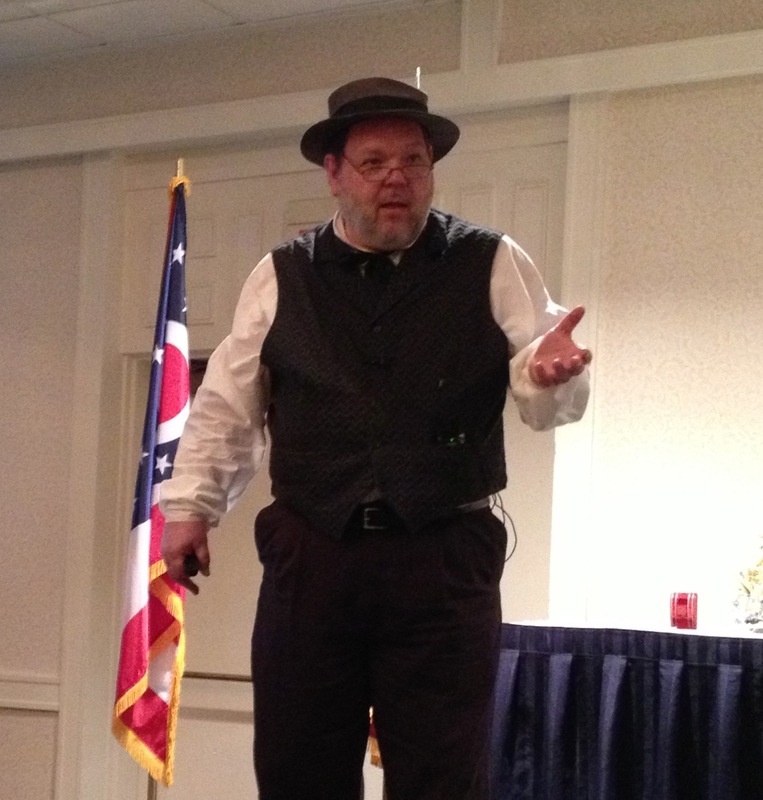 My day concluded with the Century Families of Ohio banquet. Century Families is one of four OGS lineage societies. To join, you need to document that your ancestors resided in Ohio by 100 years ago—in this case, by 1912. I proved eight of my ancestors and nine of my husband’s (I’ll list their names in a separate post). The banquet speaker, J. Mark Lowe, gave an engaging presentation on “Roads and Rails ‘Cross the Ohio River” (T24). He talked about the factors that influenced migration from place to place, characteristics of those who migrated earlier vs. later, and the practical aspects of travel. He also talked about different tools and records you can use to flesh out the story of a migrating ancestor, including diaries, travelers’ guides, and maps. 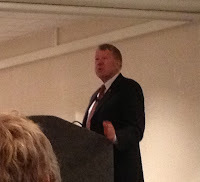 The talk was recorded, and I also noticed that Mark will be giving a similarly titled lecture at the upcoming 2013 FGS Conference in Ft. Wayne. Since I find migration to be a fascinating—and often challenging—piece of my family’s puzzle, I really enjoyed his presentation. Like I said, it was a full day—and two more still lay ahead. It takes me awhile to process these things, but I promise to continue the recap soon—though not until after I unpack and regroup! Shelley, wishing I were there, too! Thanks for the recap. I noticed someone else mentioning Lisa Alzo's self-publishing session, also--something I'd really like to hear. Just wish this country weren't so huge...or my travel calendar so limited! Thank you so much for doing this, Shelley. Do you mind if I post a link to your blog on our society's blog? My pleasure, Kathy, and by all means link away. The HCGS volunteers did a super job of planning, organizing, and making sure everything ran smoothly. Congrats on your Outstanding Chapter award--you deserve it. Hats off to you all! Great summary of day one. I agree, it was a very good conference and it was great to meet up with you. Congrats on your article's Honorable Mention and I'll see you at FGS in August! Thanks, Karen. It was great seeing you, even briefly. Conferences are so busy, aren't they? Hopefully we can talk a little more in Ft. Wayne. Looking forward to it! Thanks, Shelley, since I spent most of that day getting to Cincinnati! I like your nuanced approach to the talks. Glad to hear it, Harold. It was great to see you, and I really enjoyed your presentation (more on that in the next post...). Safe travels! Thank you for this thorough account, Shelley. I'm especially interested in finding our original emigrant on my mother's side (probably from Ireland), and there are just a few tiny bits of information about him in Maryland. So I would love to hear the recordings of Unfindable Ancestors and Immigrant identities. Maybe I can shake loose another bit of information! I'll copy this URL and try to hear the recordings of those sessions. You must be a really busy person these days! Good luck with the search for your immigrant ancestor, Mariann. My immigrant searches have proved challenging, but I do feel like I'm making some progress. And "shake loose" is a great way to describe how I feel when I manage to uncover some nugget of information! I'll be eager to hear what you find. I was also at the conference but missed the first day. I chose to spend that time at the Cincinnati Public library doing some personal research. It was a fabulous conference—always is. Thanks for letting us know what we missed. Sorry I didn't get to meet you in Cincinnati, Dodi. I hope you had a fruitful day of research at the library (I came in the afternoon before in order to look up some things there, so I can relate). Glad to know you enjoyed the conference, and hope this post helped fill in the blanks in some small way.